Because so many of our Special Gathering members were not able to attend my husband’s memorial service on Friday afternoon, we had a short memorial time at Special Gathering on Saturday and then Sunday. 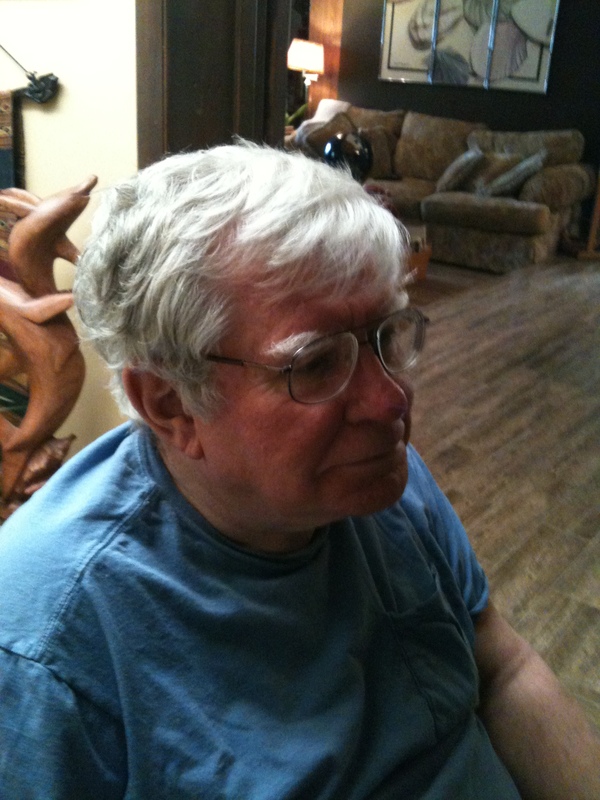 My husband, Frank, taught a Bible class for about ten years at our Melbourne Special Gathering. His students loved him. Therefore, on Sunday, our Melbourne members were asked to comment about Frank, sharing a favorite memory. Our members spoke about the times they remembered the most. I was a bit surprised. Several of the members talked about the class he taught. However, almost all of our members said, “I went to his house to eat.” His last meal, in fact, was shared with five of our Special Gathering members. Their van driver lives in Vero but she needed to do some catch-up paper work in Melbourne; and I invited the members to come and eat with us. After that meal, Frank took a large downturn; and he was not able to eat any longer. Over the years, I’ve studied the importance in the scriptures regarding the meal. I touched on this over the years in this blog. The Bible indicates that there is a bonding that happens at meal time and with the breaking of bread that does not seem to happen at any other time. The meal plays a significant part in each milestone of developing our Christian faith. Only mentioning a few, Abraham shared a meal with the Angel of the Lord before receiving the God’s promise to be made a great nation. The passover was a Seder meal. The last supper was an important time of communion for Jesus and his disciples. Even after his resurrection we know of two meals that Jesus shared with his followers. The last meal was breakfast on the beach and Jesus prepared this meal himself. I am more and more convinced that to develop a working and compatible relationship with our members and their families, the meal will help. Several years ago, our executive director, Richard Stimson, decided that we should invite our members to come to our homes and have a meal with them and their families. We invited each family and spent time with them. Though it has been years, our parents still bring up how much they appreciated coming to our home. Of course, inviting people to our homes is not the only way we can create that bond. Sharing meals is a great benefit of day trips and outings with our members. Our four-day spiritual retreat Memorial Day weekend andother camp times create the same mealtime bonding . God in his infinite wisdom has made the meal a time of pleasure and bonding that melts heart together in a unique way. Connections are made that last a lifetime. 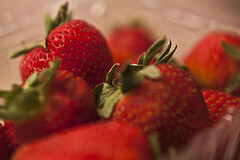 Spring in Central Florida means many delights; but one of the best is fresh strawberries. When our children were young and early spring arrived, we would pack up a small lunch and some water. Then we’d pile into a car with some friends and we’d all head for the strawberry fields. In the morning, while the dew was still on the berries, the children and I would pick enough strawberries to eat and freeze. For anyone who has worked in the fields, you know that the exquisitely satisfying part of harvesting berries is sampling the luscious sweetness while bending over the fruit laden plants. You don’t ever take home the largest, reddest and plumpest strawberries. Those are eaten in the fields. Last month, my daughter, Carol, was speaking at a conference in Tampa. She arranged to visit with us for a few days because she wanted to visit with her ailing father. 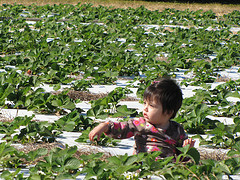 As she and I were traveling from Tampa to the East Coast, we passed a strawberry farm. The harvesters’ large straw hats were the only part of their heads that was visible as they bend over the plants hurriedly picking the ripened fruit. We spied the farm’s roadside stand. Quickly wheeling the van into the parking lot, we stopped to purchase a crate of berries. When berries have slept in the fields the night before, you don’t get one or two quarts. Twelve quarts are the minimum. Giggling, like two children who’d uncover a chest of gold nuggets, we climbed back into the vehicle, munching our treasure all the way home. The juice ran down our fingers and onto our wrist. We laughed, trying to lap up every escaping drop. That road trip was the beginning of what has become a sorrowful but surprisingly joyful adventure for our family. The day before, I had learned that my husband’s diagnosis was “adult failure to thrive.” In short, his body had moved from terminally ill into the dying process. All of the family has come now to say good-bye to their father and grandfather. He has suffered from dementia for about 15 years. We became accustomed to his forgetful ways. Yet, during these precious, holy days, he has slowly slipped closer to eternity. This morning when I went into his room, I knew that he didn’t recognize me. Because his aide was there, I didn’t ask him questions. I left the house at 7am for my work and I didn’t return until 7pm. “I’m your wife of almost 50 years and you really should remember me,” I said, laughing. With his eyes closed, he returned my laughter with his own. “You are an engineer, who worked for NASA. 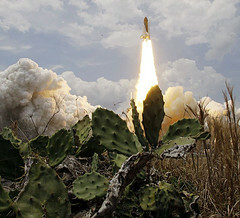 You designed much of the piping for the liquid hydrogen and liquid oxygen systems. You had five inventions. You helped put the men on the moon and no one can take that away from you. In short, you are a pretty amazing man.” He smiled. “Do you remember Jesus?” I probed deeper. Again, he smiled, but with a broader grin. “Oh, yes, I do,” he whispered to me. “That’s the only person you need to remember,” I said, taking his hand in mine. He smiled, traveling back into his semi-conscious state. When I went into his room about an hour later, he was still smiling. On the afternoon we bought the strawberries before the fruit could go bad, I prepared several quarts of the berries to freeze. They sit in my freezer at the top of the fruit section. Each time I open the freezer they sit waiting for me, still red and inviting. I’ll eat those berries while they are still frozen in a few days or a week or month from now. I’ll taste the ripe goodness locked in by the cold. I won’t eat them in one session but one berry each night. I’ll make them last as long as I can and I’ll remember this lovely time. But I’m waiting–waiting until this adventure is over and my husband has gone home to be with the Jesus he still remembers. I was asked to write a eulogy for a dear and close friend who died last week. I wanted to share with you a portion of it. She worked for years as a full-time volunteer in the school system with all children. She did stage productions, taking great joy to never exclude children with disabilities. To her, all children had a special need for an abundance of love. While we don’t ever admit it, there is something wonderful about death, that final passage of life. Because people–the survivror–are forced to stop. We stop to remember. We brace our hoe under their armpit and take off their hats. Slowly, we wipe our brows and listen and embrace the rambling noise of memories. And for a brief moment in time, we allow ourselves to rejoice in the past. We are lost something in the 70’s, our sense of tradition. But tradition is more than a processional or which side of the lectern the piano should be placed. Tradition is embodied in the story–the story of our faith. Even more, Christian tradition is embodied in the story of the Faithful. Jesus said at the last supper, “Do this to remember me.” Memory is an essential part of the Judeo-Christian heritage. The Passover is a ritual of remembering. The Jewish people were taught to remember God’s miraculous salvation interruptions that occur in our everyday lives. But somehow we refuse to allow time to remember. Our lives are wrapped tightly in the present and future. Even our older generations, don’t take the time to remember…or we don’t take the time to listen. But death abruptly unwraps the cocoons of our present and our future and we come to a screeching halt as the noise of the past slaps us in the face. The only thing John’s family, friends and I have left are our memories of him.